Unlike most seabirds, Kittlitz’s Murrelets do not nest in colonies but rely on camouflage and secretive behavior to escape predation. They will lay a single egg in a small scrape, often on the downhill side of a large rock. Their nests are extremely hard to find. 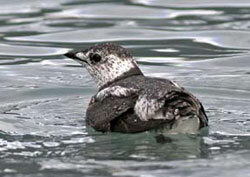 The Kittlitz’s Murrelet is mottled reddish-brown and white when breeding. It closely resembles the Marbled Murrelet and is found in many of the same areas, but the Kittlitz’s is best distinguished by observing white outer tail feathers and white trailing edge on the secondaries when the bird is flushed. The winter range is not well known. Large population declines have been reported in several core areas in the range of the Kittlitz’s Murrelet, but it can be consistently viewed during the summer months in the areas listed below.